Otherwise known as the world according to the H-T children, Connor James and Chloe Alexandra, as seen through their mother's (and sometimes father's) eyes. My book is not upside down, you are. Now hush I am concentrating. 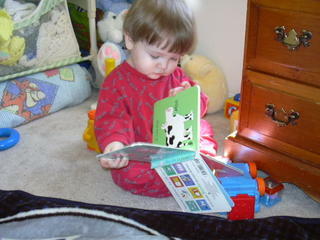 I love the reading picture. See, he's obviously reading to *you*, so the book has to be facing that way. Right? So cute!! Just wanted to pop in and say HAPPY BIRTHDAY to Connor!!!!!! Ah Rose you are brilliant :). 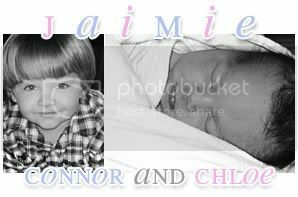 Jaimie, Matthew, Connor, and Chloe H-T. The story of our lives since the little ones arrived.